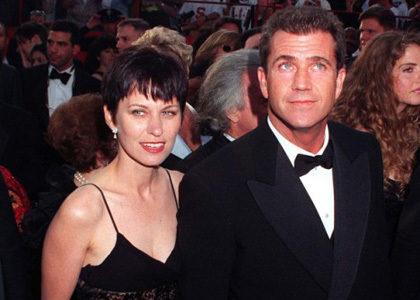 The ‘Lethal Weapon’ star’s spouse Robyn – mother of seven of Mel’s children – petitioned for their 28-year union to be officially ended in April 2009 but they are reportedly nowhere near agreeing to a final outcome. Mel – who is currently facing charges over claims he attacked his former girlfriend Oksana Grigorieva, mother of his 16-month-old daughter Lucia – got his lawyers to submit a settlement proposal to Robyn last September, but nothing has been followed up. A source told RadarOnline.com: "I guess he's too busy with the case to worry about the divorce from Robyn. They keep getting continued and they're not expected to be back in court until at least April, now." According to California law, Robyn is entitled to half Mel's reported $1 billion fortune, because the couple did not sign a pre-nuptial agreement when they wed in Australia in June 1980. Despite their own problems, Robyn defended Mel in court last July by claiming he was never abusive to her during their union at a hearing centred around the custody of Lucia. In her testimony, Robyn also claimed the actor was “a wonderful and loving father” to their children throughout their time together.